Estella's Revenge: #BBAW Day 2: Interview Time! #BBAW Day 2: Interview Time! 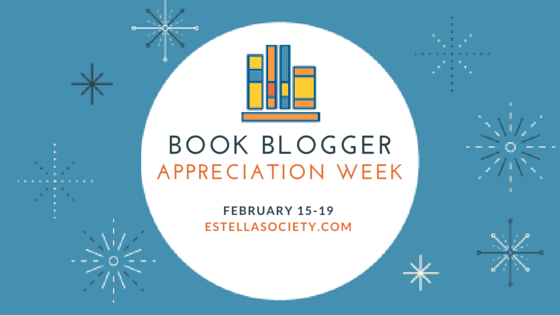 I am the most fortunate gal in the world becuase I got to interview TWO amazing bloggers for Book Blogger Appreciation Week! Let's jump right to it, shall we? First up is Rebecca from Ranty Runt of a Reader. She's a university student who reads in a wide variety of genres, and she often finds herself reading in directions motivated by her studies. She definitely favors some genres outside my wheelhouse, so I had to ask for recommendations! You mention on your blog that your favorite kinds of books tend to be "pulpy action novels, war narratives and classics." Pulpy action novels and war narratives would typically fall outside my comfort zone, but if you were to recommend where to start in each genre to a newbie, what two books would you pick? I would have to go with the Tom Buckingham series by Andy McNab for the pulpy action novel. Beginning with Red Notice, they are full of suspense and intrigue. McNab is synonymous with the military action genre, but outside the UK and Australia he is hardly known. This series is more mature than previous works, touching on serious issues in Britain today including racism, far right politics and government usage of military resources outside war. My recommendation for war narrative would have to be Matterhorn by Karl Marlantes – as long as the reader is an advanced reader. It is a sprawling 650 page epic about the Vietnam War, written by a VERY well educated veteran that is extremely critical of the war. Matterhorn has made me feel things about history that few non-fiction books have managed, and although it is fictional, it is based on Marlantes’ experiences and feels very real. I read it last in 2012, but I still have vivid scenes stuck in my head that I sometimes dream about, which to me, is a sign of an excellent book. Also, have I mentioned the writing? It has two styles – one is lyrical and full of poetry, long flowing sentences that fill your head with honey, the other style is violent and aggressive, with staccato bursts of bad language and a lack of description that feels like being mortared. The effect is jarring and unsettling, which just adds to the overall atmosphere! You also mention on your blog that you're a student of history, English, AND education at university! That sounds like a very full plate. How do you find time for reading and blogging? In Australia to become a high school teacher you must have a double degree – one is Education and the other is whatever you wish to teach. I’ve already finished my Arts degree and am just finishing up my Education degree this year, but I am going to apply for honours, so I’ll still be studying next year too if I get accepted. When semester is on I don’t have as much time for leisure, so I generally cut back on reading – but I don’t watch TV while semester is on (too dangerous because I’m a binge watcher) so reading is the way I unwind. My blogging does suffer a bit, but I let myself off the hook and just remember that blogging is a fun hobby of mine, not a job or serious commitment. How did you get into blogging in the first place? I stated reviewing books on Goodreads in 2012, and was happy to stick to that for quite a long time. Eventually I found book bloggers as I was looking at reviews for a book I had read and loved, and decided that I could give it a shot. I also really wanted to participate in the Classics Club challenge, and decided a blog would be the better way to do that. It is one of the best decisions I have made. Have you read a book yet in 2016 that has totally knocked your socks off? Dispatches my Michael Herr is a great non-fiction about the Vietnam War (coincidence that I just rec’ed Matterhorn – I don’t read THAT many Vietnam books). Herr was a war correspondent for Esquire magazine who reports more so about death than war, and refuses to bow down to the romanticism of war that is so often pushed on us. Dispatches really kicked me in the teeth, and is the first book this year that has earnt a 5 star rating from me. Thank you SO much for your thoughtful answers, Bec!!! Next up is Susie from Girl With Her Head in a Book. She's a life-long, voracious reader, she speaks English and French, and she's got one of the most beautiful blog headers in the land! Since Book Blogger Appreciation Week is kicking off, what is your favorite way to find new-to-you bloggers? What makes you fall in love with a blog? Normally I find new blogs if I'm searching for a book review and find a blog review that agrees with my own opinions! However, more than once I have been caught up by bloggers whose views are directly opposing mine - I guess I like strong views. From the beginning though, I was hugely surprised to discover the community and was delighted to find out more about the lovely people who were leaving comments on my site. My favourite blogs tend to be colourful, with regular updates and where the author is clearly having fun! You mentioned in your bio that you read fast and remember everything you read. I am totally jealous in the best way. How many books do you read a year? What draws you to pick up a book in the first place? My speed of reading varies - I've been at least 50 something for the past four years though last year it was 70. My memory for stories tends towards the encyclopaedic but then I constantly forget where I put my phone. Or my hairbrush. Or my wallet. So it balances out. As for what draws me to pick up a book ... I am addicted to bookshops, libraries and I used to live near a Books For Free Project which literally handed them out for free. I am not fussy - but I do like a good family saga. I find that in the last few years I struggle to review everything I read. What inspires you to review a book? What might make you drag your feet a bit? I tend to review everything I read - when I was a teacher, it was a real struggle and I only did 'the highlights' but I've been trying to play catch up ever since. Even with uninspiring books, I do make an effort although sometimes it is a struggle - those tend to be very short. I can really enjoy tearing to shreds a book which I have hated, it's the ones about which I am truly indifferent which are a struggle. What are your goals for your blog going forward? How would you like to branch out to other forms or outlets for writing? The blog has changed quite a bit over the past year - I migrated over to Wordpress and am really pleased with the difference, as well as being grateful to my long-suffering boyfriend who did the web design! I am interested in finding more author interviews, but I think I'm trying to focus on reading the books this year which are already on my bookshelf and not getting distracted by the shiny new review copies. The list needs to become shorter! I am also keen to work on my own writing, so I've signed up for a writing residential - I'm hoping this motivates me to write more of my own work in the intervening time! What is the most magical moment in blogging for you since you started in 2011? I think that it was the first time that an author tweeted that they liked my review - it wasn't solicited and I only noticed because the traffic on my site had a massive upwards spike. It's happened a few times since and it's been just as exciting on each occasion. The site has just been so much fun - every review copy has been a cause of celebration too. However, recently I wrote a list on top ten fictional grandparents, having lost my final grandparent a few months ago, and the online response was incredibly lovely and one of the nicest things that has happened to me online so far. Have you ever thought about giving up blogging? What keeps you firmly grounded in the practice? The closest I've come to giving up was probably January 2014 when I only managed one review, right up to the wire on the 31st. I just had no time to spare at that point but realised that if I let the site die, I would have truly grieved for it. The chance to write regularly and for an audience is incredibly important to me - it is a wonderful and inexpensive form of therapy! Even when I have felt under pressure, I have reminded myself to focus on the parts of the experience that I like best - I think it's easiest to keep yourself grounded if you remember what brought you to it in the first place. Thank you SO much to both Rebecca and Susie for answering my questions. You're both lovely and wonderful and fantastic! Ah thank you - again, my boyfriend did my blog header but I'm glad you like it as much as I do! It's so much fun finding out more about other bloggers. Hope you're having a great day! He is very talented! It's so pretty. I'm a fan of color if you couldn't tell. hehe It has been fun meeting bloggers. This event is great for that. I like sites with bright colour too - I am really enjoying this week, I feel that I've met so many new people! Thanks for taking the time to interview both Susie and I, Andi. I had a really great time answering your questions and am already having so much fun with Book Bloggers Appreciation Week. Thank you, Rebecca!!! Your answers were so helpful and insightful! Cheers! I enjoyed both of these interviews - agree about Susie's header - lovely. And I've experienced the kindness of the blogging community when sharing some of life's trials. It's wonderful that these people that you've never seen reach out. I agree with Rebecca about appreciating talking books with other bloggers. I think so many of us don't have a lot of people in our 'real lives' that we can share our love of books. It's a fun feeling. Isn't it? The community floors me, time and again, in the best ways. And yes, indeed. Sad how many of us don't have readers around us. Sigh. Luckily, my husband does read so he "gets it." Thank you for being so nice about my header! I agree too that so often people in the 'real world' don't tune in as much to the books, but they're awesome in lots of other ways and they remind me to go outside and take time to do other things. I live for talking books, and I'm not as lucky as Andi, my partner has read one novel since graduating from high school. He tells me he will fangirl with me when my favourite books become movies. There is little chance of that happening for most of my books! I'm so impressed with a college student who makes the time to read AND blog about books. That double degree approach to teaching sounds good to me. I wish I could remember some of the books I've read better. Right??? She is juggling and doing great at it! Definitely a great approach to teaching. Me too. These days it seems like I forget at the drop of a hat. Thanks bermudaonion - I agree with you about the double degree approach being excellent for teaching, I feel like I have been able to follow my passions but also learn all about how to actually educate. Also, thankyou for your kind comments, although I feel like I don't balance my life very well, sometimes I sit back and wonder how the hell I have gotten this far. A double degree AND time to read? Wow. I loved Dispatches my Michael Herr -- I read it many, many years ago, but it still resonates. I agree that it's great when an author tweets your review. I have such a horrible memory for most of the books I read -- seriously. Me too re: memory for the books I read. It's terrible. Beth, if you liked Dispatches I really do need to aggressively recommend Matterhorn by Karl Marlantes. It is on the same level. I also love it when authors tweet reviews, it gives me the warm fuzzies! Isn't it fun meeting bloggers who read in totally different genres than you? I always want to chase after them and demand that they make me a starter pack of books in that genre. Wonderful interviews, Andi! Hello, fellow Classics Club person! I don't think I've come across a lot of book bloggers with your taste in genres, so I'll definitely be checking out your archive on my afternoon break. Anyway, it's pretty impressive that you're doing a double degree, with honors no less. I hope Australia pays its teachers more than we do in the US, to compensate you for that intense education. I totally get what you mean about the uninspiring but not outright "bad" books being the hardest to review. What can you say about a book that didn't really illicit much of a response while you were reading it? Oh, and I see that you're in the Classics Club, too! For some reason it just tickles me when I find other CCers, haha. Thanks for stopping in to comment and visit! I know - the analogy I came up was 'ready salted crisps' - they're neither or good not bad, they're just blah. My usual policy is just concentrate and keep the review short and to the point - no point in wasting time trying to fake an opinion. I'm kinda obsessed with the Classics Club, to be honest, so nice to meet another clubber! And yep, my tastes are certainly not the mainstream, I've found a couple of other bloggers who write reviews for the books that I read. I find though that those bloggers aren't interested in all the other fun stuff I love about book blogging, the readathons, the memes, the challenges and events like this! So I normally interact with people who don't read my preferred genres - but everyone is so nice and accommodating that I never feel left out! Plus, I think that as I read classics I normally hang out with the classics crowd, and then they get a shock at all the explosions, murder and testosterone when they visit my blog lol. Doubling up on the interviews, what fun! I enjoyed getting to "meet" Rebecca and Susie! Yes girl! We had a blast! Great questions! This was a delight to read. Fantastic, cool, fun, energetic interviews with two bloggers I will be reading from now on. Awesomeness all around.